A musical I have enjoyed since I have first seen this movie. I even did watch this musical in a well-done stage version once. 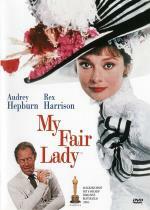 As it is well-known, Audrey Hepburn's singing voice was replaced by the voice of Marni Nixon. In the special features section there are two songs where we get to hear Hepburn's original singing voice intact. I think they could have at least kept her voice for the first part of the movie, where Eliza is still her old self. I think her voice would have fit perfectly there. I think this is a great update to H.G. 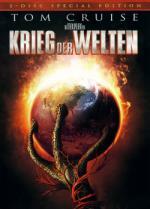 Wells' story and particular to the 50s movie adaption. I always enjoyed the fact, that not some miracle weapon or some patriotic hero showdown is the cause of the defeated aliens, but their own underestimation of Earth's environment. Instead the film focuses on the survival of one man and his kids. I only have one real problem with the movie, and that is the "Spielberg" ending. Throughout the movie we see total destruction of cities, but the one street, where the mother of the kids is staying, is almost undamaged. And then to top it, the son who didn't want to stay with the father but instead joined the army guys to battle the aliens, also appears here again. I would have found it better from a story-telling point of view, when he would have died in the fire caused by the aliens just minutes after he joined the army, as the father originally thought. This seems to be an argument that only pops up in Spielberg films! That he ruined his own plot and he should have done it this or that way. But surely such a change undermines the film entirely? Spielberg is no fool with narrative and he's an old fashioned film-maker where all the elements of his screenplays relate to one theme. Here it is simply about a family unit surviving and continuing, regardless of what happens to their environment or what decisions they make; they will always come back together. So having the son die would end the film on a gloomy, "we're all gonna die anyway so what's the point" mood, more suitable to Hostel or Saw. This is only an extension of the original story, intact here, demonstrated by the human race being entirely ineffectual when all they had to do was wait and accept good old Mother Natures own defence method. In a film of such tree-hugging optimism, killing the kids is not acceptable! My favourite Spielberg debate is of course, A.I., already discussed at great, ponderous length on these very forums. But essentially I feel the same; many think he should have stopped when David is trapped underwater, therefore missing the entire point of the whole film because it would fail to deliver on the elements in the first half. I see your point about "War of the Worlds". But I think it would have suited the movie better, when the son wouldn't have survived. Almost anytime, when I talk with someone about this movie, they either didn't like it, or they really liked it but thought the ending almost destroyed the movie. It just feels to put-on. One scene we see Cruise and Fanning just bearly surviving the attack. In the next scene everything is (like we like to say in Germany) "Friede, Freude, Eierkuchen" (similar to the English "sunshine and roses" in meaning, but in an ironic/sarcastic way). A fairy tale comes to life in this thoroughly original, new Disney Classic. And the sights and sounds are even more stunning on Disney Blu-ray. Drawing inspiration from its classic heritage, Disney creates an inspired story unlike any you've experienced before. Filled with excitement, fun and spectacular music from the legendary Alan Menken, Enchanted is the ultimate fish-out-of-water adventure. For princess-to-be Giselle, life is a fairy tale — until she's banished from the animated land of Andalasia and thrust into the very unmagical, live-action world of modern-day Manhattan. When a cynical, no-nonsense divorce lawyer comes to her aid, little does he realize this joyful, wide-eyed innocent is about to enchant him. 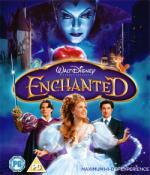 Enchanted — the musical comedy that casts a more entrancing and dazzling spell in Blu-ray™ High Definition. Amy Adams really plays the typical Disney princess stranded in the real world very well. I also enjoyed the songs. It was a good choice to let Alan Menken, who has won Oscars for the songs in "Little Mermaid", "Beauty and the Beast" and other Disney movies, write them. This movie really feels like a live-action version of a classic Disney fairy tale movie. I enjoyed Enchanted for its most part. However, I thought Susan Sarandon's acting was the worst I've ever seen her do and the big climactic fight at the end was really too much for this film and just plain terrible. In overall, I like Ella Enchanted much more, doing a similar thing much more effectively. That's my opnion, of course, your milage may vary. Ella Enchanted is one of my guilty pleasures. I have watched it about once a year since I got it on DVD. I agree, that the fight at the end was disappointing. I expected that the final confrontation will take in the animated fairy tale land, with Patrick Dempsey also getting put into that environment. But they decided to try to make a typical Disney final confrontation taking place in the real world. But nevertheless the ending did not ruin my overall enjoyment of the film. Here my summary of movies watched in 2008. The follow-up to Batman Begins, The Dark Knight reunites director Christopher Nolan and star Christian Bale, who reprises the role of Batman/Bruce Wayne in his continuing war on crime. With the help of Lt. Jim Gordon and District Attorney Harvey Dent, Batman sets out to destroy organized crime in Gotham for good. The triumvirate proves effective. But soon the three find themselves prey to a rising criminal mastermind known as The Joker, who thrusts Gotham into anarchy and forces Batman closer to crossing the fine line bewtween hero and vigilante. 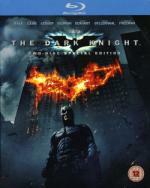 I am glad, that The Dark Knight was generally well-received. Chances that a sequel to such a well-regarded revisioning as Batman Begins is a disappointment is pretty high. But thankfully The Dark Knight did not put another end to the franchise as Batman & Robin did. It did the opposite and brought Superhero movies to an even broader audience. That said, I am still surprised that it actually is that well-received. I did enjoy it a lot, but for some reason I cannot pinpoint, why exactly this movie is so highly regarded. Maybe the death of Heath Ledger has some influence on it after all. I wonder if this movie would have broken so many records, if it weren't for this? Would have Heath Ledger's performance been applauded as much if he was still alive? I thought it was the best film of last year and Heath Ledger was magnificent. While I'm sure there are many who decided that even before seeing it because of his death, I'm not one of them. I really can't wait to see it again! My main reason for liking it as much as I do is that it's the first superhero film that stands alone as a great film in its own right, with a screenplay that would have worked alongside the great comic plots, rather than feeling like a greatest hits. OK... I am really looking forward to my copy getting here now. The highly acclaimed director of Finding Nemo and the creative storytellers behind Cars and Ratatouille transport you to a galaxy not so far away for a new cosmic comedy adventure about a determined robot named WALL•E. Experience the exciting animated hit film with theatre-quality sound and the most pristine picture available on Disney Blu-ray™ Disc. Transport yourself to a fascinating new world with Disney•Pixar's latest adventure - unsurpassed on Blu-ray™ Hi-Def. Loaded with bonus features, including the all-new animated short "BURN•E," this 2-disc set overflows with fun for the entire family. Also the two bonus shorts "Presto" and "Burn-E" are great. Especially "Presto". 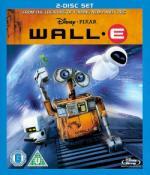 I love WALL-E...absolutely amazing movie. And the shorts are so cute too. From the creators of Cars and The Incredibles comes a breakthrough comedy with something for everyone. 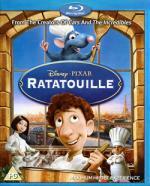 With delightful new characters, experienc Paris from an all-new perspective, and savor a fourmet high-definition experience on Blu-ray Disc®. Another really great Pixar movie! Highly recommended! A fun story and great animation. As usual, Pixar make the human characters more cartoony, instead of trying to be ultra-realistic only to fail at it. The backgrounds/sets are really great.